I'm not so proud of this one as drawings go as it doesn't look like my dad's face at all and is all a bit wonky but as I have no photos of reference for any of this time in my life the details of hairstyles etc are a bit fuzzy! What I do remember is (around 8 years old still, Zimbabwe) the travelling circus comes to town. My dad used to be quite the photographer (I think he was working at the time teaching Photography at the local art school). 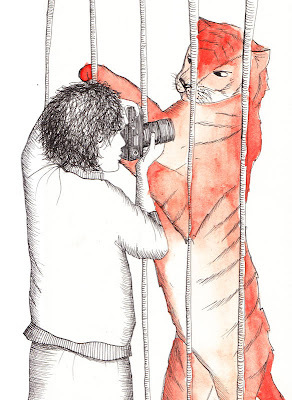 He was standing right at the bars of the Tiger's cage, he thought he was doing the zooming in on the camera but no it was the Tiger zooming in on him! He ends up with the tigers paws and claws wrapped round his leg. The next thing I remembered was a nun looking cleaning his mauled leg but he tells me she was in fact the Tigers Tamer! Not doing the best job there then was she!